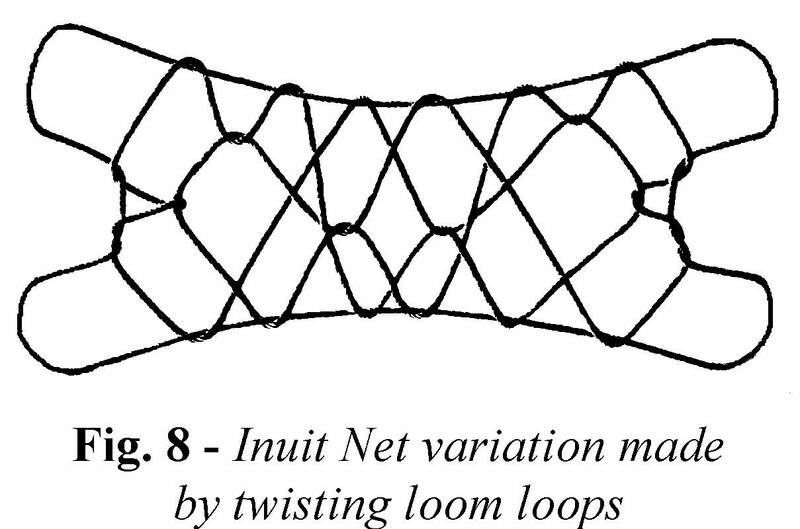 Loom alterations constitute a fool-proof way for making variations of a parent figure. As long as essential features of a loom are conserved, additional loops and/or twists almost always add complexity and richness to the final design. 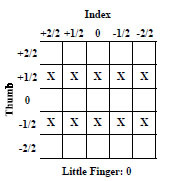 For the North American Net Loom (Opening A), essential features include: (1) the presence of one or more loops on each thumb, index, and little finger, and (2) the presence of transverse or “straight-across” near thumb and far little finger strings. In my notational system, +1/2 indicates a half-turn rotation away from you whereas -1/2 indicates a half-turn rotation towards you. Likewise, +2/2 indicates a full rotation away from you whereas -2/2 indicates a full rotation towards you. 0 is used to indicate no rotation at all. Full-turn rotations are easily accomplished by tracing out a circle with the tip of your finger, avoiding adjacent loops. Half-turn rotations are best accomplished using two transfers (a method I call “rolling”). For example, to accomplish a +1/2 rotation of the index loop, first transfer the index loop to the thumb, inserting the thumb from below, then re-transfer this loop to the index, inserting the index from above. To accomplish a -1/2 rotation do the same, but reverse from above and from below. Rolling avoids the awkwardness of having to use the opposite hand to lift a loop off a finger, twist it, and reset it. Full rotations can also be accomplished by rolling (i.e., by using four transfers to combine two half-turn rotations). Opening A, rotate thumb loop +2/2, rotate index loop -1/2, rotate little finger loop +2/2, then make the ‘Inuit Net’ from the beginning, as if you had Opening A on your hands. The result is shown in fig. 8 below. To tabulate the outcome of all possible combinations (-2/2, -1/2, 0, +1/2, +2/2) for each of the three loops of our loom, one would need three matrices. Note, however, that half-rotations of the thumb and little finger loops are not permitted since they alter the position of the transverse strings that eventually become frame lines of the final design. Students should therefore place an ‘X’ in these rows and columns. Katilluik is an Inuit word meaning “to share or bring together” and is useful for adding richness to a design since loops are doubled. 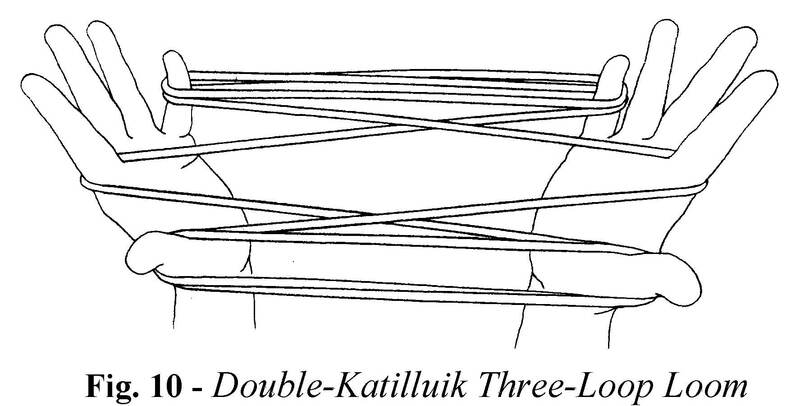 The Double-Katilluik Three-Loop Loom is a very important beginning position for me, and many of my favorite patterns begin with it. Insert the right thumb, from below, into the left thumb loop and withdraw the left thumb completely, leaving two loops held loosely on the right thumb; then reinsert the left thumb, from below, into the two loops on the right thumb and extend. 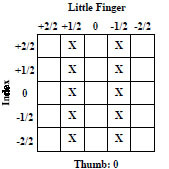 Insert the right little finger, from below and from the far side, into the left little finger loop and withdraw the left little finger completely, leaving two loops held loosely on the right little finger; then reinsert the left little finger, from below and from the far side, into the two loops on the right little finger and extend (fig. 10). For practice try making the Navaho Net using a Double-Katilluik Three- Loop Loom. Throughout the weaving process treat each double string as if it were a single string. The result is shown in fig. 11 below. In some of my more advanced creations like ‘Navaho Release’ and ‘Murphy’s Mouth’ I selectively retrieve only one of the double strings during the first weave. You might wish to experiment with this modification as well. Insert the left index, from below and from the far side, into the right index loop, then insert the right index, from below and from the near side, into the upper left index loop and extend (fig. 12). This creates and extra set of near and far index strings, both of which are transverse. 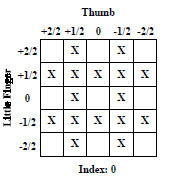 Transfer the thumb loop to the top of the index, then insert the left thumb, from above, into the right upper index loop and return with the right upper near index string (rotate thumb toward you and up as you retrieve the string); insert the right thumb into the left thumb loop from below and extend (fig. 13). This creates an extra set of near and far index strings which cross. 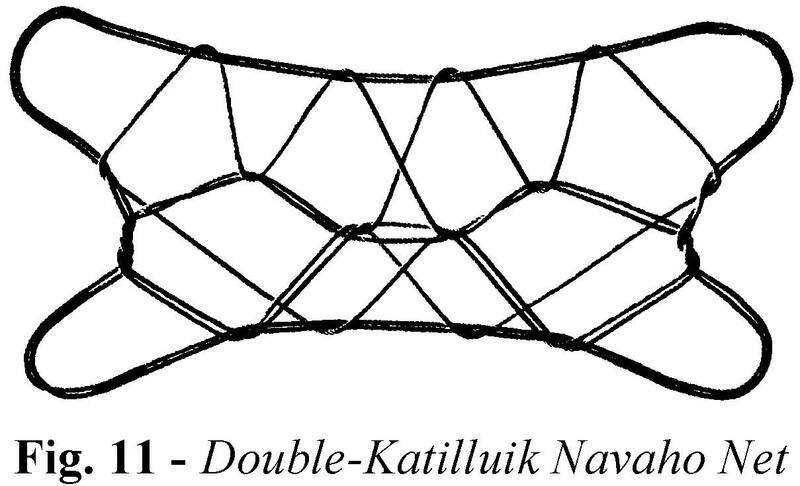 For practice try making the Inuit Net using a loom in which the index loops have been doubled using Method 2. Throughout the weaving process treat the double index loop as if it were a single loop. The result is shown in figure to the left. Again, you might want to experiment by passing the thumbs down through only one of the two index loops in either the First or Second Inuit Weave. later lessons will include the five pointed star along with other beautiful figures.